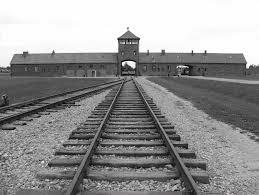 Today, as you’ll most probably know, is Holocaust Remembrance Day. Bagni di Lucca was not exempted from the worst horrors of the last war. 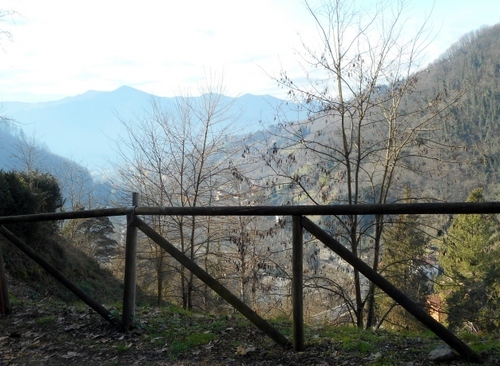 Although it narrowly avoided being bombed to smithereens, a fate that Castelnuovo di Garfagnana, further up the Serchio valley, had to suffer (see my post on that at https://longoio.wordpress.com/2013/04/09/vecchio-castel-nuovo-and-the-fury-of-war/ ), it became one of two ‘collecting centres’ (the other being at Socciglia where a memorial stone marks the place) for undesirable members of the human race which 99% of the time meant those of Jewish descent. 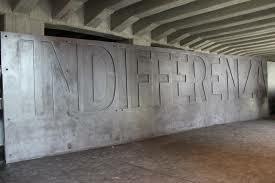 (Trans: “This place knew the inhuman suffering of patriots and the incarceration of civilians waiting to be deported to Germany and a more tragic fate. We entrust the memory to future generations so that they may travel more decisively on the paths of peace”). Under the abomination of the racial laws promulgated by Mussolini in 1938, largely a propaganda gambit to please his new ‘pact of steel’ ally Herr Hitler, Jews were marginalised by Italian society into what became ghettos. The irony is that the word ‘ghetto’ originates from a district in Venice, Italy largely inhabited by Jewish people. The ‘Regio Decreto 17 Novembre 1938 Nr. 1728’ minimized civil rights for Jews, excluded them from schools, forbade them to hold any public office, greatly limited their travel, stripped them of their property and assets. Eventually, at the height of the Italian civil war of 1943-45 (when the partisans and allied forces fought against the puppet ‘social republic’ of Salò set up by Hitler under the pretended governorship of Mussolini, ‘rescued’ from imprisonment at the Gran Sasso rifugio), people of Jewish origin were rounded up and incarcerated in local concentration camps to await their transportation to the death factories of Auschwitz-Birkenau, Mauthausen and Belzec. To the honour of the vast majority of the Italian people the laws were unpopular and even prominent fascists like hero Italo Balbo opposed them. Italy’s Jewish population had lived in the country for centuries and were fully integrated in the life of the community. Merely thinking at random of some great Jewish Italians one recalls the names of Rita Levi-Montalcini, Italo Svevo, Lorenzo da Ponte, Natalia Ginzburg, Anna Magnani, Vittorio Gassman and Castelnuovo-Tedesco to be fully aware of the incredibly high contribution this community has made to the enrichment of Italian life and culture. The concentration camp for Bagni di Lucca was situated in the now derelict and crumbling walls of the old Hotel delle Terme behind the church of San Martino, above the present Hotel delle Terme. Three children, Luciana, Paolo and Liliana, with an added-up age of less than three years were the first to be killed with another thirty children and teenagers when they arrived at Auschwitz. They died in front of their parents, their grandparents, uncles, aunts and cousins. In all, the total number at Bagni di Lucca taken to the extermination factories was one hundred and twelve. Only five managed to return to Italy alive. The Bagni di Lucca Konzentrationslager contained not just people from Bagni di Lucca but also from many other parts of Italy. The prisoners stayed there for six months without proper food, no heating and few clothes and passed what was one of the hardest winters the area has ever suffered. Throughout my hour there tangible feelings of a terrible evil and of a great sadness almost overpowered me. The prisoners from the ex-albergo were transported by train to Lucca and thence to Florence. 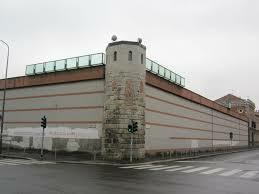 From Florence they went to Milan where they were housed in that city’s notorious San Vittore prison near Piazza Aquileia. They were then taken to Milan central station where they left for the gas chambers from the infamous ‘Binario 21’ (platform 21), still there to this day and now turned into a monument to the victims of the Shoah. It was utilised for mail trains before being used for its sinister purpose between 1943 and 1945. It’s below the main station platforms and can be entered from a side door. (Binario 21 is visitable as I did some years ago. The web site is at http://www.memorialeshoah.it/italiano/adv.html ). Figures show that 7,680 Jewish people were deported to the death camps, representing over 17 per cent of the total Italian Jewish population – a relatively low (!) percentage when one considers that 85 per cent of the Jewish population in Lithuania were exterminated. 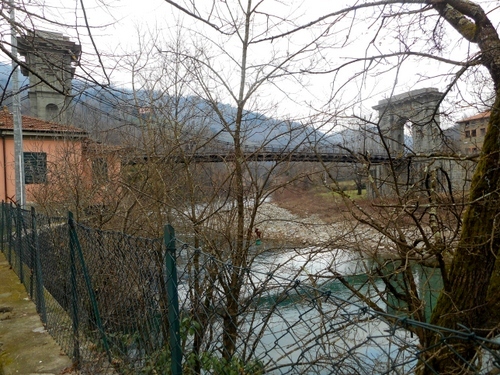 To return to Bagni di Lucca: some of those deported died on the train journey to Auschwitz. Crammed like sardines into cattle trucks, Angela Ferrari, for example died aged just 26. Was there anyone brave enough to stop this happening to them? Yes. The number would have been much higher had it not been for Don Arturo Paoli who only died last July aged 102 and who is on that great list of ‘the just of all nations’. 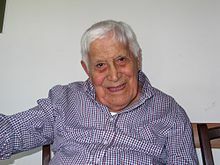 It is my eternal regret that I only found out recently about this man from Lucca who collaborated bravely with DELASEM, the Jewish resistance movement, to save over eight hundred Jews in this part of Italy from entering the extermination camps. At least, however, we know a close relative of Giorgio Nissim, the organiser of DELASEM, from Pisa. 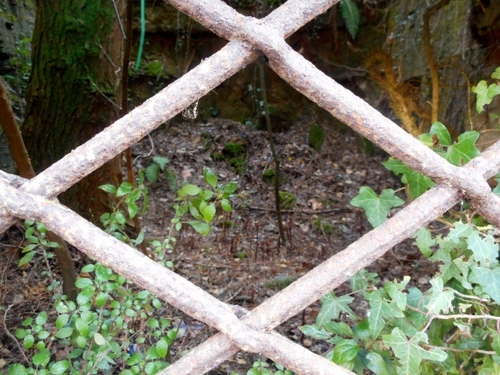 Who were the five from Bagni di Lucca who survived? Among them was Leo Urbach, Liliana’s father who had to suffer the killing of his wife and two children Liliana, aged less than two and his son aged five before Auschwitz was liberated by Russian troops on January 27th 1945. (That’s why we have International Holocaust Remembrance Day on that day). 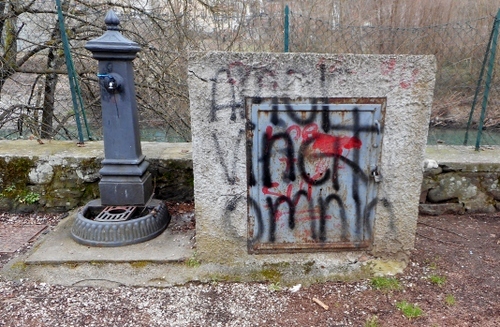 What memorials are there to the Shoah as experienced by Bagni di Lucca? 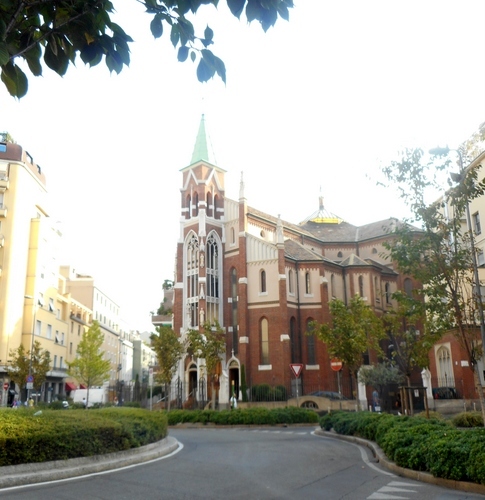 In Fornoli there’s the peace park with this memorial to little Liliana, inaugurated in 1999. 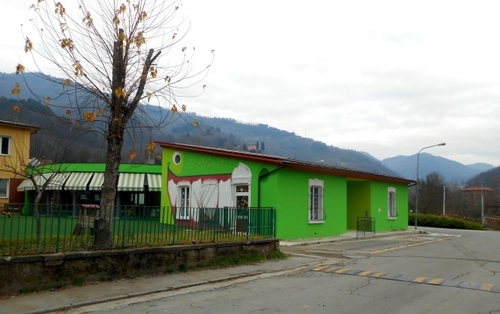 It’s next to the primary school where in all probability Liliana would have gone had she lived. Behind it was the old Ponte delle Catene over the Lima. Built by the great Nottolini in the nineteenth century it seemed to me that both it and the graffiti had a message to say about loving each other and building bridges. And yet the killing, worse, the genocide, still goes on: by fanatics just across the sea from us and by the sea itself. Since last year over 3,000 people, including a shamefully large number of children, have drowned while trying to cross the Mediterranean in boats handled by unscrupulous people-smugglers . Meanwhile, the sinister and decrepit façade of the old Hotel delle Terme has nothing to show on it that this was the last sight many people would have had of their beloved families and their beautiful country. This, in my opinion, is a scandal that must be rectified as soon as possible. Here is a building that, more than any other in this area, witnessed man’s brutality to man and people pass by it without realizing what purpose it was used for. A memorial plaque should be placed on it now because if we don’t remember……..
a stork takes to flight. No, we are not in Nepal but at Expo 2015 in Milan. Near the west entrance of the fair is the Nepalese pavilion with, in its centre, a reconstruction of a characteristic temple much as one might see in Kathmandu or Bhaktapur. 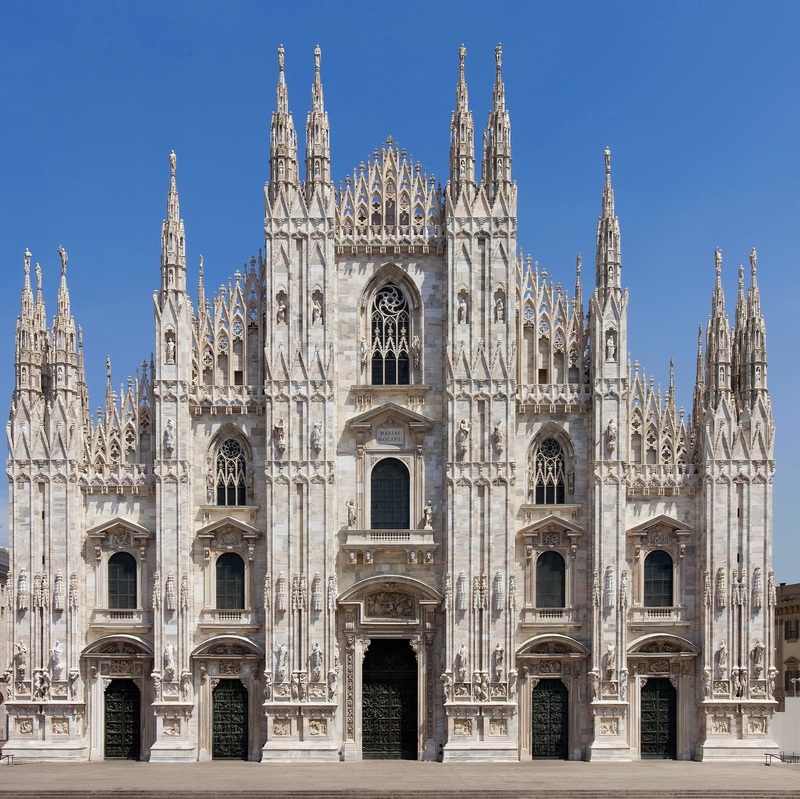 The temple at Milan is particularly poignant since it was far from completion when the catastrophic earthquake shook that country and shattered so many lives and buildings. 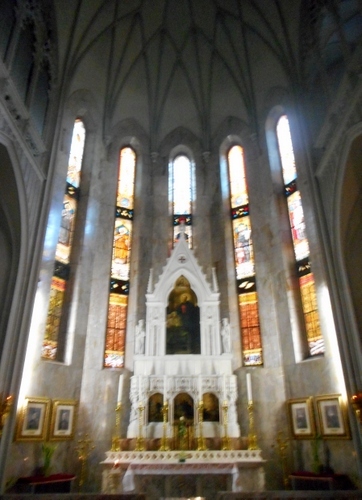 The temple took five years to sculpt and it arrived in Milan in hundreds of pieces in containers. When the earthquake hit in April many Nepalese working on the temple had to return to their country to join distressed families and sadly, in too many cases, attend funerary rites. Through a display of solidarity with the Nepalese people, workmen from a firm in Brescia were called in to help complete the temple in time for expo’s opening, offering their labour completely freely. 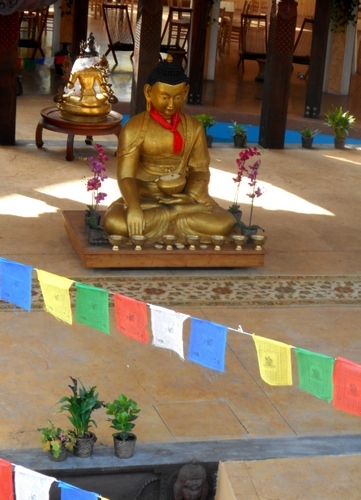 The temple’s Buddha statue was thus blessed in time for Expo’s inauguration. 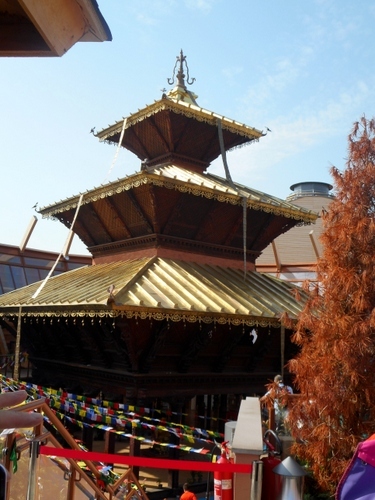 Visitors to the temple have already offered close to half a million euros towards Nepal’s reconstruction and when the expo closes the temple will be offered to the highest bidder. 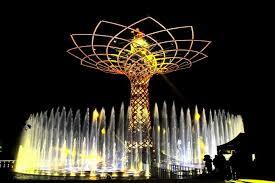 It would be nice to see it in some park in Milan rather like the peace pagoda in London’s Battersea Park. The temple is a delight with its intricate wood carving depicting gods and goddess in the Nepalese pantheon. It certainly made me feel I was back in a country I’d visited quite a few years back. With fluttering prayer flags, Nepalese dishes and handicraft on offer in the precinct, the area provided us with a great start to our second day of sightseeing round Milan’s huge and rewarding expo 2015. Vittorio Sgarbi is one of Italy’s most distinctive personalities. Art critic and politician he is noted for his often controversial cultural and political views. Sgarbi is a maverick certainly, but a very well prepared one with always interesting arguments. I first came across Vittorio during a conference on villas in the lucchese area in September 2009 where I acted as a translator for some items and where Sgarbi’s contribution to the tutelage of the Lucchesia’s unique landscape was as pointed and stimulating as ever. 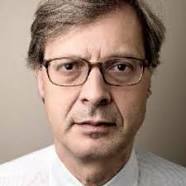 Born in Ferrara in 1952, Sgarbi has been a member of parliament and also of local administrations like that of Milan. He has also been tried for various offences including defamation, calumny and fraud (the usual common Italian ones in other words). Between 2008 and 2012 he was mayor of the Sicilian comune of Salemi before it came under direct government control because of mafia infiltration. Sgarbi is now part of the local government of the comune of Urbino where he is in charge of culture and the countrywide. We visited Urbino last year and were suitably impressed by the way this wonderful hill town of the Marche, which had such a flourishing renaissance culture, was run. 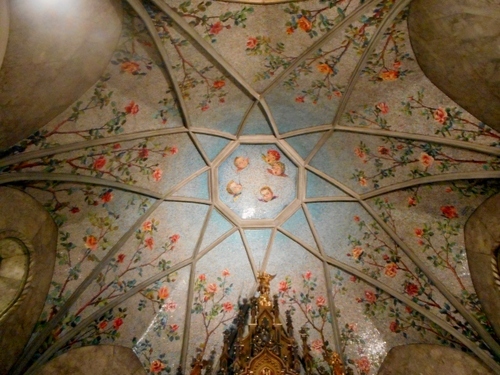 (You can read about Urbino in my post at https://longoio.wordpress.com/2014/04/29/a-fairy-tale-palace-par-excellence/). It was, therefore, with considerable interest that we explored Sgarbi’s selection of neglected Italian masterpieces in the Italian pavilion during our visit to Expo 2015 in Milan a couple of weeks ago. Here is a selection of items on view. They are significant in presenting a virtually alternative view of Italian artistic creation through almost a thousand years and, certainly, they introduced me to many painters unknown to me until now. I’ll let you work out where and when they were created. Sgarbi’s selection is as idiosyncratic as his personality. For me the paintings and sculptures he has selected also display certain foreign influence which I would not have suspected in Italian art, such as Viennese secession, expressionism and primitivism. But then if you look at paintings, from Sgarbi’s home town, of the Ferrara school they are among the most unusual to be found in Italy, displaying considerable Nordic influences. Clearly this quirkiness has been inherited by Vittorio himself. Anyway, the exhibition is one of many unmissable feature to been seen at Expo 2015 if you love Italian art (and who doesn’t?).. PS ‘Con Garbo’ doesn’t mean ‘with Garbo’ but ‘with taste or tact’. Is Milan’s Expo 2015 Worth It? 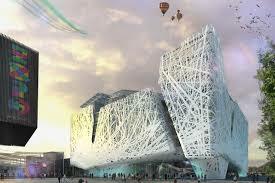 The short answer is yes, it is worth visiting Expo 2015. It’s a brilliant experience with some beautifully presented pavilions built in a variety of innovative architectural styles and, somehow, the message of helping to feed the world using earth-friendly techniques does get through. But be warned, expo requires at least two days in Milan, stamina, a good pair of walking shoes, an ability to withstand the great temperature changes that fascinating city is prone to and the patience to endure long queues for some of the most exciting pavilions. If you haven’t visited Milan before then expo should be combined with a visit to this seriously under-rated Italian city which is jam-packed with great historical sites from ancient Roman columns through one of the most spectacular of Europe’s gothic cathedrals to wonderful museums and fabulous art nouveau buildings. We stayed in a perfectly adequate hotel near porta Venezia which enabled us to get to the expo site at Rho quickly using the urban rail system. Many may ask which are the best pavilions to visit. It’s all a matter of taste! We loved the Thai one with a shop where one could choose ready prepared Thai food and have it micro waved for you. The UAR had both amazing desert simulating architecture by Foster and a moving show within. Nepal was touching with its ornate temple built in the wake of the catastrophic earthquake it has recently suffered. Japan was great with both virtual and live shows and a good restaurant.The coop’s supermarket of the future was awesome as was also the robotic bar, shaken but not stirred. Indonesia, Angola and several others also impressed. Art critic Sgarbi’s selection of unusual Italian works of art must also not be missed. Throughout the expo we were glad of the fountains distributing both still and carbonated water freely. How lucky we are to have this precious element! It was fun to have our ‘passport’ stamped with the countries we visited. In some cases with remote south Pacific islands the stamp was actually drawn by the host. There certainly was an awareness of how precious our planet’s resources are and the need to conserve them. There was also an awareness of the wealth disparity of so many countries. The gulf states really splashed out on their pavilions while some of the smaller African states and countries like Yemen and Afghanistan had to make do with standardized wooden cubes and were largely concerned in selling their crafts. It’s so sad to realise that so much of the world’s wealth is spent on totally futile activities like those creating Europe’s present refugee crisis. So many Arab states have rapidly expanding economies clamouring for more Labour force that they too should be able to ease the pressure off Europe. What is clear, however, is that expo 2015 is literally giving us food for thought and that the next big expo will take place in one of those vastly changing Arabic states. 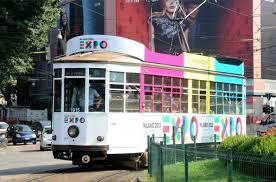 So do go to expo 2015 if you can but realise that, in the end, Milan’s finest attraction is the extraordinary city itself.